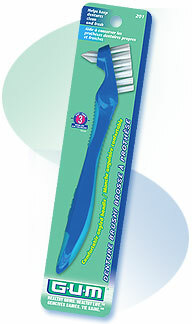 The Butler Gum Denture Brush helps keep dentures clean and fresh. Wide head makes cleaning easier by gently but effectively cleaning outer denture surfaces. Tapered head makes cleaning easier by thoroughly and efficiently cleaning curved areas. Comfortable angled handle for better control.